Its a shop inside the structure, the perspective of the table its okay? No, it`s not. The table has no perspective at all. 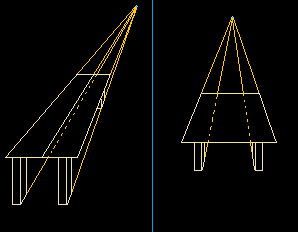 Perspective means that all the straight lines of a certain plane /dimesion aim to one or two (may be even more) points. 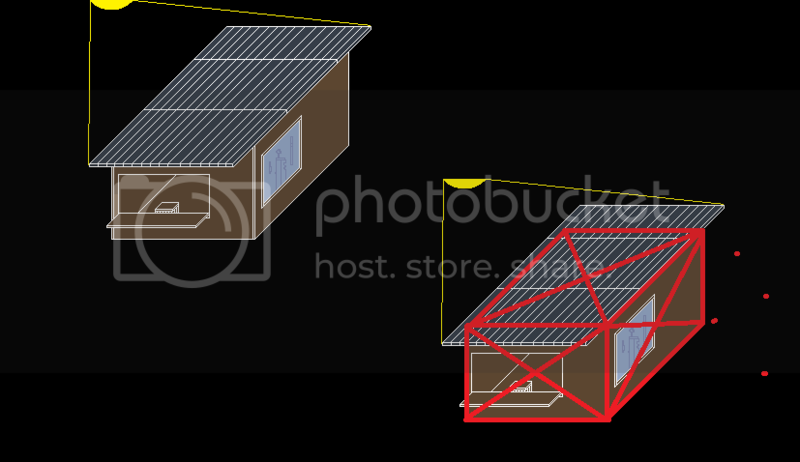 That is to say, in case when perspective is not used (in isometric pictures, for example), parallel lines never meet; in case when it is used, they meet in one certain point. Thus, you should define the point where your parallel lines cross, and then... you know what to do. P.S. Is your house supposed to seem round? If you want to learn the basics about perspective, you should begin with standard "blocky" shapes. That`s all what I can say for now. It has a better shape to it. It actually looks recognizably like a building now! I will say that I think traditional art might be a bit better suited to gaining a general understanding of perspective in this way than pixel art it - try looking at some pictures of buildings from different angles and sketching them yourself to get a feel for how you look at things from angles. You`re doing it wrong. Here`s sort of an example how it should be. 1. You choose a point at your picture. Let it be the middle of the picture for the first time. 2. You think what you want to draw and where you want it to be. And I know that you want to draw a block. Not a building or fence, just the simplest block you can ever imagine. 3. You draw it letting all the horizontal lines horizontal and vertical lines - vertical, but all the other lines - aimed at the chosen point in the middle of the picture.